US POP SUPERSTAR Madonna felt “compelled” to adopt four-year-old twin girls from an orphanage in Malawi after hearing of their plight through her charity work, court papers revealed today. Yesterday, the High Court in the Malawian capital Lilongwe granted the singer permission to adopt the twins, adding to two other children she has already adopted from the country. Court documents detailed how the twins were taken in by the orphanage because their mother died soon after childbirth, their father left to marry another woman, and their grandmother struggled to look after several children. Some Malawian activists have criticised Madonna for allegedly bending the rules and for exploiting one of the world’s poorest countries. But judge Fiona Mwale said the singer would provide a loving family life for the children in “a luxurious, spacious and comfortable abode in an affluent neighbourhood” of the United States. The ruling also said that Madonna, 58, was “above the age normally considered within the ranges of parenting” and had submitted a medical report to prove her good health. “Her charity work brings her into contact with orphanages… and it was as a result of this contact that she felt compelled to fill a gap in their lives and open up her home to them,” Mwale said. “The petitioner satisfied me that this adoption is motivated by her desire to offer a home, love, protection and guidance to the infants. The ruling said the twins’ father, identified by the initials AM, gave his consent for the adoption and accepted it “permanently terminates” his parental rights — adding that he had not received any incentives. Madonna’s earlier adoption of David Banda in 2006 and Mercy James in 2009 from Malawi have been plagued by accusations from some biological family members over lack of contact with the children. The US singer, who was in court for the private ruling, has made no immediate comment and it is unclear if the family have left the country. She set up a charity called Raising Malawi in 2006, and has been a regular visitor to the country, taking David and Mercy last year when she visited a children’s hospital surgical unit funded by the charity. She has not always been welcomed with open arms. In 2013, she was stripped of VIP status by former president Joyce Banda’s government, which accused her of being “uncouth” and wanting unending gratitude for her adoptions. But in the 2014 election, Banda was ousted by Peter Mutharika who has moved to repair the relationship, saying “my government has always been grateful for the passion Madonna has for this country”. The singer, who divorced film director Guy Ritchie in 2008, now has six children after the adoption of twins Esther and Stella. Tackling the controversy over the requirement for adoptive parents to be resident in Malawi, the court said Madonna qualified because residency “is defined not by the length of stay in a country, but by establishing a presence”. Maxwell Matewere, director of the Eye of the Child charity, told AFP that the singer should “take a different approach from adoption by supporting poor families with vulnerable children”. “Most families would love to raise their own children in a local environment if given the support,” he said. Ken Mhango, local head of the African network for protection and prevention of child abuse and neglect (ANPPCAN), criticised the secrecy and tight security around Madonna’s case. Two weeks ago Madonna flatly denied being involved in any fresh adoption application in Malawi. At her two appearances at court, she was escorted by security guards and police. 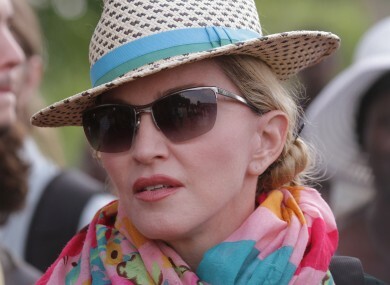 “Madonna is portraying Malawi as having a pool of poor children on the market for adoption,” Mhango added. The twins, who have five other siblings, were reportedly from the Home of Hope orphanage in Mchinji, 110 kilometres (70 miles) west of Lilongwe. Madonna was also ordered to comply with a home survey report within one year to check on the twins’ progress. Email “Madonna felt "compelled" to adopt twins from Malawi orphanage”. Feedback on “Madonna felt "compelled" to adopt twins from Malawi orphanage”.